Description: ESP Ra.De. 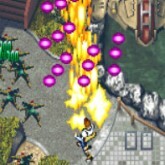 is one of my personal favorite Cave/Atlus arcade shoot em up games released in 1998. The story takes place in 2018 (lol) where Tokyo is under threat buy criminals and terrorists.Select from a mysterious group of characters known a ESPers that want to bring peace to the Tokyo. The gameplay and graphics are so smooth. Playing as flying humans is very intriguing and different compared to other SHMUPs. Game Controls: Shift Key = Insert Coin. Enter Key = Start. Arrow Keys = Move. "Z, X, C" Keys = Action Buttons. Select the option icons located at bottom of the game screen to edit controls, Play In Full Screen, Save/Load game progress, and change graphics settings.